Let’s ring in the New Year, VIP Style! 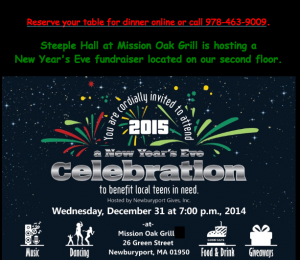 Newburyport VIP Mission Oak Grille will be hosting a New Year’s Eve Fundraiser together with Newburyport Gives to benefit teens in need. The celebration starts at 7 p.m. and will feature music, dancing, giveaways and amazing food like Rack of Lamb and Ahi Tuna. Tickets are $75 per person, and they can be ordered on Eventbrite. Oregano’s Ristorante & Pizzeria on Pleasant Street is also be full of cheer this NYE, featuring Cuppa Joe Jazz Quartet and a special four-course menu with a complimentary glass of champagne. This special menu will be offered alongside Oregano’s traditional dishes, so use your Newburyport VIP to receive 10% Off Dine-In Only ($10 Max Discount). 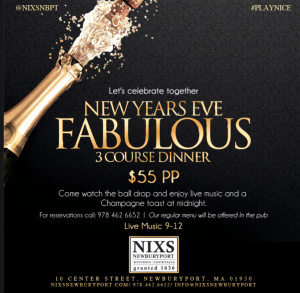 Or you could choose to #PlayNice @NIXSNBPT. For $55 per person you can dance to live music starting at 9 p.m. and enjoy a three-course dinner with champagne toast at midnight. Can’t pin down a babysitter? Celebrate next week at NIXS Newburyport using your Newburyport VIP Card to receive 15% Off Lunch Until 4 PM Wed-Sat & 25% Off Dinner 5 PM to Close Sun-Wed.